This is an interior shot of 1920 Pierce Arrow automobile. The car was part of the Pierce Arrow Club's annual car show held at the Gilmore Car Museum near Battle Creek, Michigan. 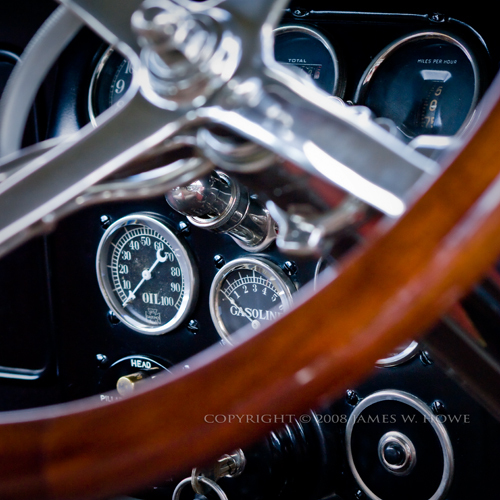 What I find interesting about this shot is the look of the gauges, particularly the speedometer. Instead of using some sort of sweep hand, it rolls up like an odometer (and tops out at 75). This image has actually had very little processing done to it. The shot was originally in a 4/3 aspect ratio but as I looked at the image I decided that I would prefer a square crop. 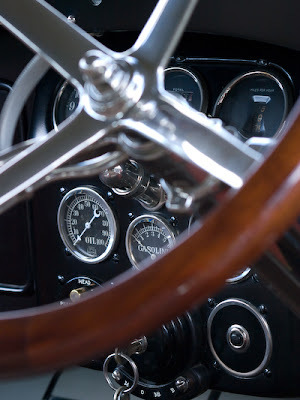 I wanted the emphasis of the shot to be on the gauges and the full shot had some stuff below the steering wheel which dragged my eye down and out of the image. The main processing for the shot was done in Lightroom 2 with a tiny bit of post processing in Photoshop. Other than the crop, the main thing I did in Lightroom was to add a 'post crop' vignette of -21 with a feather of 62. The vignette tool gives a nice darkening around the edge which helps draw the eye into the image and the feather helps to smooth out the vignette so you don't really notice it that much. I didn't want the vignette to be a distraction on it's own. Image and text Copyright © 2008 James W. Howe - All rights reserved. This image (and others) are available for purchase at my ImageKind gallery. Also, please check out my new website at www.jameshowephotography.com. Right now the site has a single gallery of some of my favorite images, but I hope to be adding more galleries in the future. Thanks for looking in and please feel free to leave any comments you might have. This blog represents a notebook of sorts for various images that I have taken. In particular, images will be posted with more detailed information about why I took the shot, where I took the shot or the post processing I used to produce the finished image. I hope anyone viewing this blog enjoys the images and gets some benefit out of seeing how I used Photoshop to produce my images. Helpful comments and suggestions for improvement are always welcome. My other galleries include www.jameshowephotography.com and Flickr.